More than 500 junior and senior high school students from across the state will descend upon the University of Wyoming campus May 15 to learn more about science and its various disciplines. The Women in STEM (science, technology, engineering and mathematics) Conference, scheduled 8:30 a.m.-2:45 p.m., is designed to spark students’ passion in science, technology, engineering and mathematics fields; and provide the students mentors and role models. The conference formerly was known as the Women in Science Conference. “This is a great opportunity for young women in Wyoming to learn about all of the different possibilities for STEM careers and college majors, as well as an opportunity to meet some incredible role models in STEM,” says Shawna McBride, senior research scientist in the UW Department of Physics and Astronomy and with the Wyoming NASA Space Grant Consortium. McBride adds that many young women in junior high and high school start to lose interest in science and engineering careers, but research shows that, if they see role models who look like them and engage in hands-on STEM experiences, they are much more likely to see themselves as scientists and engineers. During the conference, participants will engage in 26 hands-on workshops and lab tours, and have the opportunity to meet professionals who “do science” on a daily basis in their careers. The conference will conclude with a screening of “DREAM BIG: Engineering Our World,” an IMAX film narrated by Oscar-winning actor Jeff Bridges and produced in partnership with the American Society of Civil Engineers. The Wyoming NASA Space Grant Consortium hopes the film will inspire conference participants to follow their dreams and showcase the marvels that engineering can produce with a little creativity in problem-solving, McBride says. 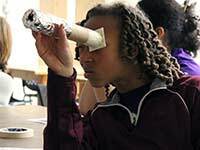 Volunteers from UW and regional organizations will present workshops on a variety of science and technology-related topics, including animal behavior, astronomy, building aquatic invaders and computers, 3-D virtual reality and satellite remote sensing. Workshop presenters are: UW faculty and students, and also from Cheyenne Mountain Zoo, Wyoming Army National Guard, the Denver Zoo, National Oceanic and Atmospheric Administration and the U.S. Geological Survey. Workshops will take place in the Agriculture Building, Biological Sciences Building, the Classroom Building, Coe Library, College of Education auditorium, Engineering Building, Geological Museum, Michael B. Enzi STEM Facility, Physical Sciences Building, Wyoming Union Senate Chambers, Shell 3-D Visualization Center, UW Harry C. Vaughan Planetarium and the Williams Conservatory. “I liked meeting new people, experiencing hands-on activities and becoming more knowledgeable about the medical and plant professions,” says one student who previously attended the conference. Major supporters of this year’s conference include: Wyoming NASA Space Grant Consortium, College of Arts and Sciences, Wyoming IDeA Networks of Biomedical Research Excellence (INBRE), College of Engineering and Applied Science, College of Education, Haub School of Environment and Natural Resources, Tata Chemicals and the Wyoming Council for Women’s Issues. -- Casper: Centennial Junior High School and CY Middle School. -- Cheyenne: Johnson Junior High School, St. Mary’s Catholic Middle School and South High School. -- Cody: Wyoming Connections Academy. -- Douglas: Douglas Middle School and Douglas High School. -- Glenrock: Glenrock Middle School and Glenrock High School. -- Goshen County School District 1: Lingle-Fort Laramie Middle School, Torrington High School, Torrington Middle School and Southeast School. -- Lander: Lander Middle School. -- Laramie: Laramie High School and UW Lab School. -- Lusk: Wyoming Virtual Academy. -- Mountain View: Mountain View Middle School. -- Pinedale: Pinedale Middle School.